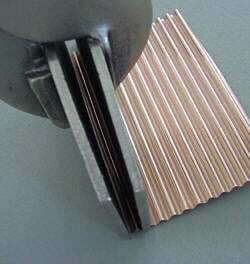 Sheet Metal Tool Modification: Look for: WISS Hand Seamer (as LAST resort BRAMEC or VISE-GRIP) sheet metal bending tools and modify as shown. 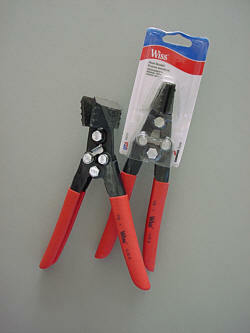 Recommended for QUICK, tight crimping! 1. I prefer the Wiss Hand Seamer Model HS-1 (3.25″) or as a LAST resort you can purchase Vise-Grip Locking Sheet Metal Tool #23 (3″) or Bramec sheet metal tool-straight handle (3″ seamer comes in 6″). 2. So the tool tip will fit into the troughs to crimp the crests: bevel up 1/4″, knife edge, by grinding the length of the tool face and back plates. 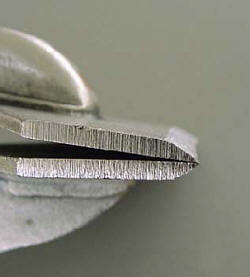 Vise-Grips: If there is a gap between the faceplates, adjust the center slightly with a hammer. Or tighten the locking screw, release the handle then turn the locking screw a quarter turn. 3. 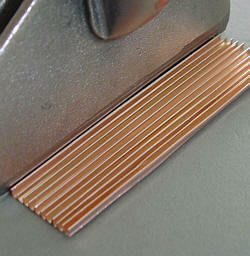 Place the tips of the tool into the troughs and crimp! It takes patience and practice with hand placement, gripping and releasing to get the rhythm. You can do it!! 5. 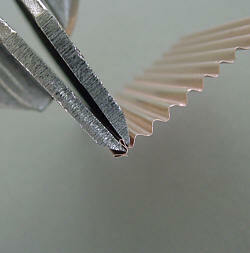 Crimped sheet using the modified Vise-Grip Locking Sheet Metal Tool. You just go have fun!